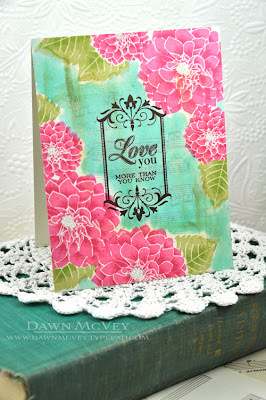 In our afternoon session at the reunion we used an inspiration card by Dawn McVey - you can see the original card and how she achieved such fabulousness on her blog here. 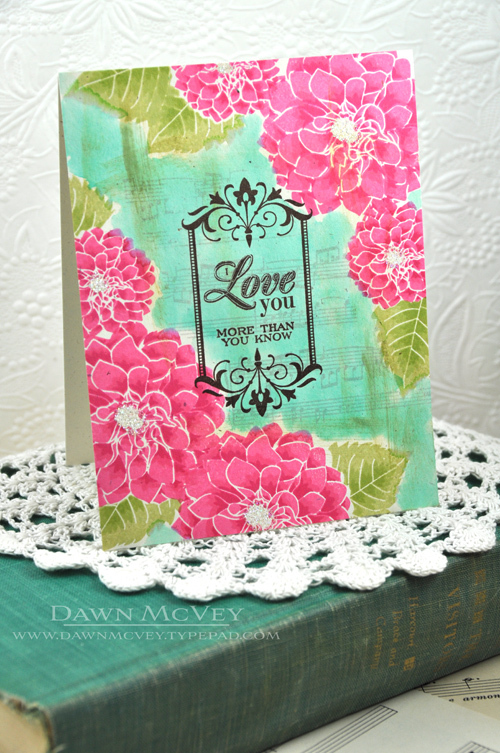 When Dawn first posted this card Pam thought it was fantastic and so do I! We had lots of flower stamp sets on the table and some watercolour pencils and Stampin Up watercolour crayons to help us achieve "the look"! I have to admit that I totally cheated with my card and wimped out on the water colouring but I had a good reason - I was like a cat on a hot tin roof all day waiting to hear if I was offered a new job I had two interviews for earlier in the week! It's kind of hard to create when you have a sick feeling in the pit of your tummy because you want something so much! Well I got the call and it was good news - so here we are enjoying champagne cocktails to celebrate! Many thanks everyone for such a lovely day - can't wait until Stamp a Faire later in the month when I hope we can do it all again. loved all your cards - they are all fantastic. and what a great ending to your day with champagne cocktails and good news! Fantastic cards , all of them! And a perfect end to the day with such good news too. I love your 3-d-gorgeousness and Sue's 'non flowers' are fantastic too, so stylish. Smile- lovely cards and so glad you could celebrate with good news. Looking forward to SAF fun! Well firstly, my sweet friend, CONGRATULATIONS on your new job!! I'm so happy for you!!! That's fantastic news!! And secondly, you all made such gorgeous cards and it looks like you had so much fun while you were at it!! Loved reading about your fun day!! Been working on SAF prep a lot lately -- it's going to be another great day! So glad you girls are planning to participate!